The vending machine is usually associated with the negative aspects of our culture: instant gratification, over-consumption, mindless consumerism. But this vending machine is very different. It is known as the Swap-O-Matic, and its goal is to change the way we think about acquiring objects. Rather than rushing off to the store to buy something brand new, why not swap something you have and don’t want for something you don’t have but need? 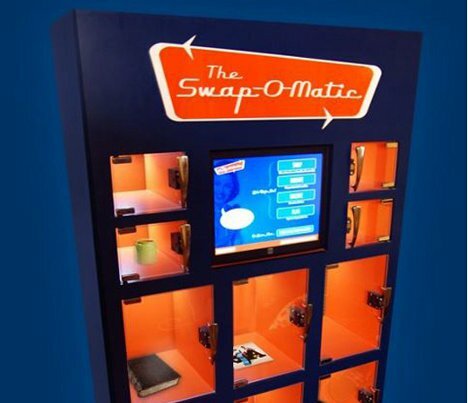 The Swap-O-Matic is like a swap meet that’s free for everyone but which causes positive social change. The machine works solely on credits – no money ever changes hands. As seen in the video above, shoppers use credits to pull items that they want out of the machine and earn credits by donating items. Safeguards like user flagging are in place to ensure that the honor system isn’t abused. The Swap-O-Matic is part social commentary and part pop-up store; it has appeared in several NY locations and continues to travel around the city, bringing with it a message of reducing, reusing and recycling.